I am a tea snob. Tea is an art form, I tell you! 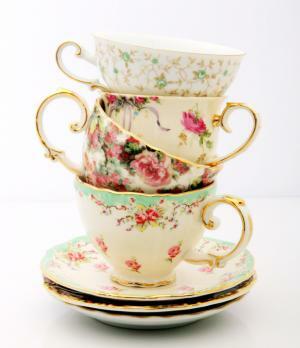 I love beautiful tea pots and large tea cups. I love different types of sugar and know exactly how to sweeten the tea to perfection. I don’t like milk in my tea, but if I’m serving others, there must be a lovely creamer at the table. And then there is the tea itself. My favorite is Nambarrie. It’s a Kenyan black tea sold in Northern Ireland and it is splendid. Herbals are great, especially at night when winding down. Green tea is also a favorite. I love the light citrus undertones. If I’m ever going to get pretentious about anything, it is going to be my tea. Starbuck’s is a point of contention for me. I prefer to champion local shops. The atmosphere is generally more unique and cozy, and the drinks are often better. The other reason I can’t stand Starbucks: they cannot – for the life of them – make a decent cup of green tea. Now to all the Starbuck’s barista’s out there, I apologize if you know how to make green tea correctly. I know I am generalizing. It’s tricky to get it right only because no one really advertises how, especially the tea companies themselves. I started drinking green tea when I first began high school and could not figure out why some cups were bitter and others were fine, even though the tea bags came from the same box. It’s an easy mistake to correct. Here’s the biz on how to make your green tea correctly. Green tea leaves are more delicate than black. As such, brewing green tea with boiling water will scald the tea leaves. This makes the tea taste bitter or vegetable-y. It’s not pleasant. By brewing the leaves with water of a decent temperature, you can avoid this problem. If you’re boiling the water yourself, you will want to take the pot off the heat just as the tiny bubbles begin to form at the bottom. Don’t let it get to a rolling boil! I am very high maintenance. Most of the time now, when at a coffee shop, I just request that the tea bag be left out so I can put it in at my own discretion. Again, what can I say, I’m a tea snob. This is my small plea to the world asking that we all go green and respect the leaves! Let the water cool first and you will have the best cup of green tea available. *pushing hipster glasses up the bridge of my nose* Sorry for the lack of irony there. I’m just trying not to be mainstream. I am now going to go sort my drawer of mustache assecories and coordinate my Toms with my recent Urban Outfiters thrift store purchase. Next Post Who’s Planning This Thing?